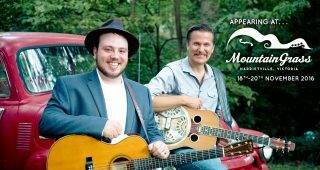 Mountaingrass 2016 … brought to you by YOU? The selection committee is hard at work on choosing from the nearly 70 excellent applications we received from artists this year. We had hoped to have decisions done by June 1st, but we want to get it right, so that date is going to slip a little bit. We are ever trying to bring you a bigger and better Mountaingrass, and build you a better ABOTMA. Won’t you take a very few brief moments and give us your opinion on how exactly you would like us to do that? It would be very much appreciated. And as a special incentive, everyone who responds goes in to a draw to win a special prize! It isn’t too late to be a part of the action by volunteering as a festival organiser, or weekend helper. Email info@abotma.org.au or fill out the contact form at http://mountaingrass.com.au/volunteer/ to put yourself in the control seat. We look forward to hearing from you! Joe builds custom acoustic guitars, classical guitars, mandolins, Irish bouzoukis and parlour guitars. He uses a careful selection of timbers to get the volume, balance and lovely colour of tone that Joe’s instruments are treasured for. Joe never sets up a display or brings a banner to Mountaingrass, because he doesn’t have to, he always sells everything he brings without it. The picture says it all. 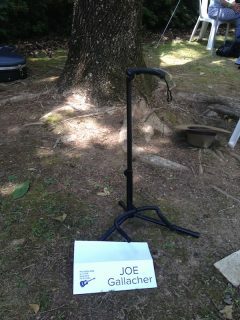 Learn more about Joe’s line of beautiful instruments at his website: http://gallacherguitars.com/.